Saint John the Little was a monk and hegumen of Scetis (Wadi Natrun) during the first great period of early Egyptian monasticism. John bears witness to the formative period of early Egyptian monasticism. His Life, with its emphasis on obedience and compassion, offers a lively witness to the earliest monastic traditions and to their transmission and continuing importance in the Coptic Church. 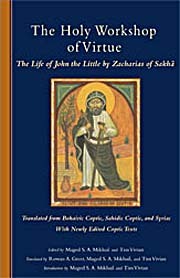 This book contains an introduction to the textual history of the Life of Saint John the Little (339 – 409) along with fresh English translations of the Bohairic and the Syriac Lifes of John the Little plus the definitive Bohairc Life in the Coptic text. It will be of interest particularly to academics, monastics, and others interested in monasticism, early Christian monasticism, early Church History, the Coptic Church, or monastic spirituality.